I traveled on the Tea Party Express tour bus as a singer/songwriter, entertainer and spokesperson — 16 states, 34 rallies in two weeks. I experienced vicious racial verbal attacks, not from the Tea Party protesters. The racial hate expressed against me all came from the left, people who support President Obama's radial socialist agenda. Unfortunately, my deleted email box is littered with numerous messages expressing the following, "You are the dumbest self hating f****** n***** I have ever seen!" These racists are outraged by my opening lines I boldly proclaimed at each rally. "Hello my fellow patriots! I am NOT an African-American! I am Lloyd Marcus, AMERICAN!" At every rally, my proclamation inspired great applause and cheers of joy and approval from the audiences. After each rally many came to me with tears in their eyes. They said, "I thank you from the bottom of my heart for what you said. I am Irish (or Italian, or Asian) American. And yet, I would never hyphenate. I feel hyphening divides us. While it is fine to honor one's origin, let's all be American first." The Tea Party audience's passionate response to my proclamation was a surprise to me. I did not know so many Americans disapproved of hyphenating pushed on us via political correctness. I rejected hyphenating years ago. One day I woke up and heard I was no longer black, I was African American. Anyone rejecting the new term was called ignorant, insensitive and an Uncle Tom if you are black. Not intending to be provocative or controversial, I casually stated that I am not a hyphenated American, but simply an American at a Tea Party. The audience's cheers of approval were surprising and heartwarming. 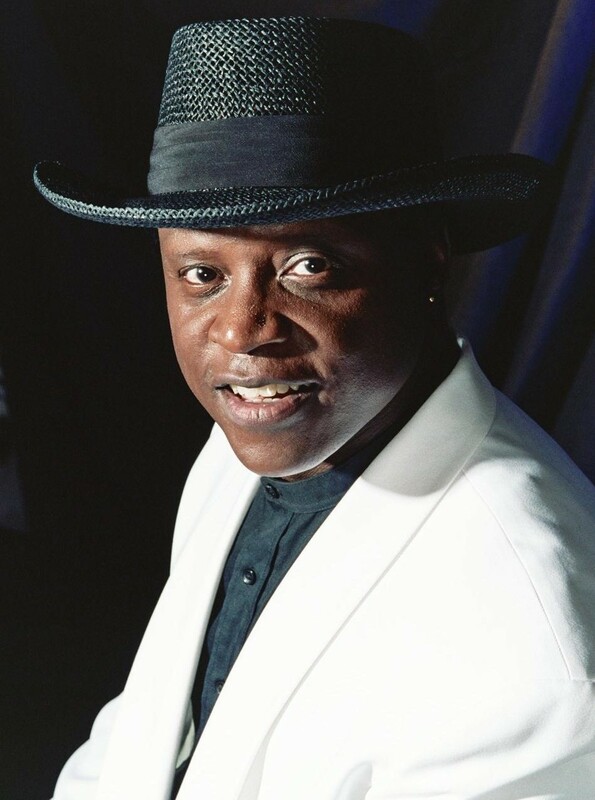 As I said, I am a singer, songwriter, entertainer, and columnist using my gifts to spread the message that conservatism is best for all Americans. Liberals' response to my YouTube videos, columns, and performances on the Tea Party Express have been extremely racist, vicious, and hate-filled. In their incredible arrogance, they vilify me for loving my country and not viewing myself as a victim of white America. In the sick minds of liberals, I must support — as a black man in America — President Obama regardless of his policies. I must resent white America. I must feel entitled to the earnings of other Americans. My belief that my success or failure is totally in the hands of myself and my God is anathema to them. As to the claim that the Tea Party protesters are racist, they are not. Quite the opposite. At every rally with thousands in attendance, I was overwhelmingly showered with affection and thanks for standing up for America. 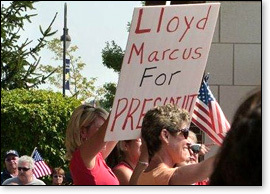 At one rally, a sign read, "Lloyd Marcus for President." These protesters are not racist. They are decent, hard working, oridinary Americans who love their country and disapprove of the racial changes planned by the Obama administration. Race is not an issue with them. They have deep concerns for their country. Disgustingly, Obama-ites use race to silence the protesters. They know it is an effective weapon to use against decent people. Ironically, the people the Obam-ites call racist are the same people who hate hyphenating. They want to be united as Americans. The grand finale of the Tea Party Express Tour took place Saturday, September 12, in Washington DC at the U.S. Capitol. I performed my song "Twenty Ten." The crowd of over a million loved it. C-Span posted my performance on YouTube. Shamefully, C-Span had to delete the hate-filled racist comments posted by Obama supporters in response to my performance. Why do so-called tolerant and compassionate liberals think it is OK to freely use the "N" word when referring to blacks who escape the "liberal plantation"? Despite Obama-ite's hideous charges of racism, this amazing Tea Party movement is driven by passion, concern, and love of country by the American people. A Tea Party Express "whistle stop" in Mt. Vernon, Texas, epitomized the mood of the movement. We were late leaving our Dallas, Texas, rally. We would arrive late at our rally in Memphis, Tennessee. The decision was made to cancel the road side "whistle stop" in Mt. Vernon, Texas. Besides, it was only supposed to be a brief stop for a few folks to tour the bus, take pictures, and give us homemade treats. Then, we received the call, "You MUST stop. There are a lot of people here!" The State Police led our Tea Party Express Tour bus into a crowd of 500 to 800 cheering, excited people. They treated us like rock stars. Totally unprepared, the truck with our sound system was on its way to Memphis. We did not have a sound system or a stage. We made our way through the crowd to the bed of a pick up truck. National radio talk show host Mark Williams, blue star mom Deborah Johns, singer Diana Nagy, the Rivoli Revue (Ron and Kay), and myself climbed on board. Someone handed Mark a bull horn which he used to encourage the extremely enthusiastic crowd. We said the Pledge of Allegiance and Diana led in the singing of "God Bless America." Many in the crowd were sobbing. Then they showered us with thanks, hugs, bottled water, bags of snacks, and homemade treats. I thought, "How many angry, racist mobs bake and bring brownies and overwhelm a black guy with affection and hugs?" Once back on the bus, our team struggled to hold back tears. We felt humbled, honored, and blessed. Though extremely well received at each rally, this "whistle stop" drove home the passion, love of country, and importance of our mission to preserve and Take Back America! The Tea Party protesters are hard-working, decent people who love their country and want us all united as Americans. I am highly offended that this evil administration seeks to divide us, not just by race, but also by class envy. As I said to many of the audiences along the Tea Party Express bus tour, "I love you. Stay strong. Do not allow their calling you a racist to shut you up! Stand up for America. God bless you. And God bless America!"